An inside look at America's largest newspaper--The Wall Street Journal "Phillips offers fascinating insights about American business, politics, and journalism. He traveled in the circles of CEOs, U.S. presidents, prime ministers, and royalty; always at his core he was a reporter. That is the beauty of Newspaperman." --Vernon E. Jordan Jr., civil rights leader; senior managing director, Lazard Freres & Company; adviser to President Bill Clinton "[Phillips] captures the fabulous stories of a scrawny, precocious boy from reporter to publisher and then CEO, participating in and then presiding over the Journal's years of greatest growth." --Joan Konner, Dean Emerita, Columbia University Graduate School of Journalism "Phillips fell in love with newspapers when he was a boy. He's still infatuated but he doesn't skip over his tough times or mistakes. That's what makes Newspaperman such a telling guide to the newsroom and to the top office in the executive suite." --Lou Boccardi, former president and chief executive, Associated Press; former chairman, Pulitzer Prize Board "This lovely book recounts the life of a wise, thoughtful, and admired newspaper editor and publisher. The tiny Wall Street Journal Warren Phillips joined grew up to be a giant. Newspaperman tells that story." --Donald E. Graham, chairman and chief executive, The Washington Post Company "[Phillips provides] perceptive commentaries on Germany, Greece, Turkey, England, Spain, China, Russia, and the Middle East. All is told with modest good humor, but repeatedly emphasizes the need for integrity and high standards." --George B. Munroe, retired chairman and chief executive, Phelps Dodge Corporation "The story of a boy born in Brooklyn, a reporter, an editor, a publisher, a corporate executive, and now the author of a fascinating book." --James Q. Riordan, former vice chairman, Mobil Corporation "In spite of a few hiccups, honestly related here, Dow Jones was rated by Fortune magazine as the second most-admired company in the United States, and so proved that an outstanding newspaperman can also achieve enormous success as a business builder and leader." --Hamish Maxwell, former chairman and CEO, Philip Morris Companies Inc. "A memoir from a man who helped transform The Wall Street Journal from a local newspaper to a global operation...Throughout the book, Phillips looks at his part in shaping the Journal's news and editorial coverage, and these sections provide insight into his highly successful methods. The author includes many anecdotes culled from his diaries, some very funny, which illustrate the variegated aspects of his life and the people who shared in it...A well-rounded autobiography about the journalism industry and the people who shaped the news over the past 50 years." --Kirkus Reviews "The sections about the rise of the Wall Street Journal's quality and influence are fascinating - for journalists and non-journalists alike." --Philadelphia Inquirer "Phillips provides an arresting retrospective on modern world history that general readers will find informative and delightful." --Star-Telegram About the Book When Warren Phillips was eleven years old, his father took him on a guided tour of the New York Daily News, where he got his first look at the frenzied yet surprisingly ordered and controlled world of newspaper publishing. He saw everything from the industrial printing presses churning out newspapers at astonishing speeds to reporters hunched over their typewriters, writing the very stories those presses would be producing within hours--or even minutes. Phillips was hooked. He knew exactly what he wanted to do with his life. Newspaperman tells the story of how an immigrant's shy son from Queens, New York, rose to the top of his industry powered by little more than passion, brains, and hard work. Phillips began his career working as a copyboy for the New York Herald Tribune for sixteen dollars a week--and ended it as publisher of The Wall Street Journal and CEO of its parent corporation, Dow Jones & Company. The life story of Warren Phillips is the story of the American newspaper business. Here, the details of his vast experience come together to create a broad picture of the newspaper business-- revealing how news is discovered, reported, edited, published, and disseminated. Sharing vivid tales of working as a reporter around the world and describing the many colorful characters he meets along the way, Phillips provides a level of insight that only a leading figure in the industry could offer. 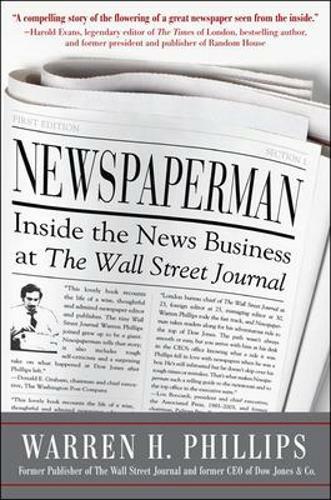 Newspaperman gives you an up-close look at one of the most influential people in the history of The Wall Street Journal--and an unprecedented view of the business, from its rapid modernization during the post--WWII , cold war era to the early years of digital publishing and the rise of the Internet, which may mark the decline of the printed page forever. Phillips's entertaining, penetrating, and impressively detailed account is a must-read for both devotees of America's most iconic business publication and anyone with an interest in how news is reported. "A memoir from a man who helped transform the Wall Street Journal from a local newspaper to a global operation. When executive editor Bill Kerby and managing editor Buren McCormack hired the 21-year-old Phillips (China Behind the Mask, 1973, etc.) as a $40-per-week proofreader in 1947, daily circulation stood at 100,000. By 1991, when the author retired after serving as the publisher and CEO of Dow Jones & Co., the paper was the largest daily in the country with a circulation of around 2 million. Phillips provides insight into how one of the nation's most prominent newspapers evolved. The author was personally involved with much of the growth, after his transfer to London and then Germany to build the paper's operations in Europe, and he was integral to the development of the Wall Street Journal Asia and the paper's partnership with Japan's Nikkei index. Under his leadership in the '70s and '80s, the paper became a technological leader through its deployment of satellite communications and its embrace of digitization. Throughout the book, Phillips looks at his part in shaping the Journal's news and editorial coverage, and these sections provide insight into his highly successful methods. The author includes many anecdotes culled from his diaries, some very funny, which illustrate the variegated aspects of his life and the people who shared in it. In a short epilogue, Phillips discusses Rupert Murdoch's takeover of the Journal and its incorporation into News Corp.
A well-rounded autobiography about the journalism industry and the people who shaped the news over the past 50 years." -- Library Journal "Library Journal"